Twin Lakes is a peaceful gem of a campground with fishing, frog gigging, and hunting in our backyard - water level permitting. We are surrounded by two major hunting management areas located on historical Cross Creek, which connects Lake Lochloosa to Orange Lake. Cross Creek is featured by Pulitzer Prize Winning Author, Marjorie Kinnan Rawlings in her books and movies, The Yearling and Cross Creek. We are one-half mile from Marjorie Kinnan Rawlings house where she lived and wrote about her life on the creek. New!! 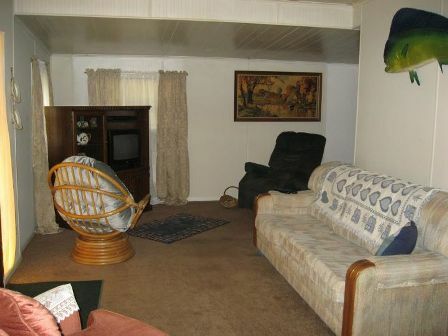 A completely recently renovated mobile home. A complete home at your disposal! Tackle shop, Recreation Room, Screened Lanai, Fire Pit, Covered Picnic Pavillion, Laundry Room, Restrooms with Hot and Cold Water for Showers, Dump Station and Fish Cleaning Station. Fully furnished cabins w/dish tv, full hook-up and primitive sites for RVs or tents; recreation hall w/dish tv; screened recroom; fire pit; covered barbecue area; horseshoes; boat rentals; canoe rentals; airboat tours; general store; bait and tackle; propane; ice; bath house and laundry facilities. Good hunting/fishing base camp for sportsman.